A review in 10 words (or thereabouts): Tula uses words to escape the traditional constraints of 19th century Cuba. Tula fears turning fourteen. At fourteen she will be forced to marry a complete stranger. Her mother and grandfather are searching for her would-be husband, a man of wealth that can bring the family riches. But Tula will not marry for money. She will marry for love and respect, a man who understands her passion for words and her belief that slavery should be ended and all people freed. Tula finds the courage to break with tradition and discovers love, friendship, and the freedom of which she always dreamed. Told as a novel in verse out of homage to Gertrudis Gomez de Avellaneda, a Cuban abolitionist who used poetry as her voice against slavery, Engle weaves a beautiful story of defiance and passion. Poetry is not my go to format and novel in verse is often difficult for me to get into, but Engle makes it accessible, enjoyable. At the beginning of the story, you really get to know Tula, her fears of marrying for money, her heartbreak as she experiences slavery and rejection. Mid-way, the story gets rushed. As she meets the man she will love, there's no connection, no passion, no chemistry. One page she meets the young man, the next she loves him. And who is he? Is he really worthy of her love? I don't really get the title either. Maybe I missed something... Always possible. 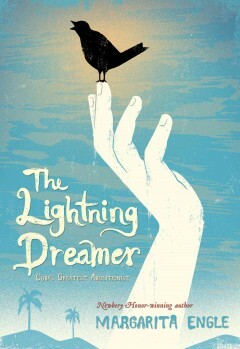 I picked The Lightning Dreamer: Cuba's Greatest Abolitionist up on a whim. I needed something different, and this definitely fit the bill. Despite the too fast of a pace, the story was beautiful, and Tula is definitely a character you can rally behind. Engle also makes you curious, wanting to learn more about the historical figure and the life she lived. More about Cuba and its struggles. Overall, a thoroughly enjoyable read.